500 Rare Butterflies Discovered in Ore.
CORVALLIS, Ore. -- About 500 rare butterflies were recently found thriving in the hills west of here, thrilling conservationists who hope the colorful Taylor's checkerspot will fight back from near extinction. The new colony, along with roughly 1,000 butterflies on nearby private and county park land, account for about three-quarters of all Taylor's checkerspot known to exist. The rest are scattered across 10 sites in western Washington. "It's extremely exciting, because this is the largest population we have on publicly managed land," said Scott Hoffman Black, executive director of the Xerces Society. The Portland-based invertebrate conservation group has asked the federal government to declare Taylor's checkerspot an endangered species. "We found the population where they're already trying to do habitat restoration," he said. An ecologist found the latest population in some meadows at the county-owned Beazell Memorial Forest north of Philomath late last month. 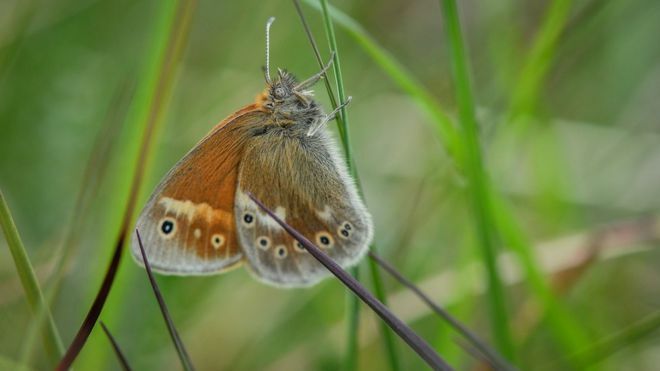 Significant loss of upland prairie in the Willamette Valley over the past century and a half has nearly wiped out the butterfly, Hoffman Black said. Scientists estimate less than 1 percent of this important habitat remains in isolated spots threatened by invasive weeds, encroaching fir trees and development. "As the prairie habitat has gone, the butterfly has gone," Hoffman Black said. The new population is a pat on the back for Benton County, which has worked to improve habitat and preserve pockets of native prairie. The butterflies feed on wild strawberry, hairy cat's ear, rosy plectritis and other native wildflowers. "It's an excellent indicator that we're doing something correctly," county Parks Director Jerry Davis said. "This shows we have some really nice property and what we're doing is not messing it up." The Xerces Society began working to protect the butterfly and its habitat four years ago. It has developed a close partnership with Benton County, which is trying to protect the largest population about 1,000 in and around the parks department's Fitton Green Natural Area, north of Philomath. The plight of the butterfly persuaded the society to pursue its first-ever lawsuit. It recently filed a 60-day notice of intent to sue the U.S. Fish and Wildlife Service to place Taylor's checkerspot on the endangered species list. The agency lists Taylor's checkerspot as a candidate for the list, Hoffman Black said, but often it takes pressure from environmental groups to compel the agency to formally list a species. Hoffman Black said the species occupied more than 70 sites as recently as the mid-1970s. "We've lost at least 60 populations in the last 30 years," he said. "So we know this butterfly is endangered and needs to be protected. We do not want to sit on our hands." We have a couple mammoth threads and clone threads but, I think it could go here. Well, you've brought this thread back from extinction, if nothing else! The iconic puffin has come back from the verge of extinction to flourish on a British island - thanks to the eradication of predatory rats. The popular bird has been a feature on Lundy Island for centuries but its numbers fell to just five ten years ago and it was feared it would be wiped out entirely. But wildlife experts say they have just counted more than 300 individuals, of which around 100 are breeding. The revival is being credited to the ridding of all rodents on the island, which lies 12 miles off the North Devon coast. The turn-around in fortunes is the result of the Lundy Seabird Recovery Project. It involved eradicating rats, which feast on the eggs and chicks of burrow-nesting birds like puffins, between 2002 and 2004. The island was declared rat free in 2006 and the breeding puffin population has re-established itself over the last ten years. The project was a partnership between the RSPB, the Landmark Trust, Natural England, and the National Trust. National Trust general manager for Lundy, Rob Joules, said: "It's great to reach the 10-year milestone of Lundy being rat free and to see its wildlife thriving in direct response. "This was an incredibly important and worthwhile project to be involved with and it's great to know the lessons learned are being implemented on other offshore islands around the UK." The project was initially focused on boosting the population of Manx shearwater which at the time was a higher conservation priority than puffin. RSPB senior conservation officer Helen Booker added: "We expected Manx shearwater would benefit from rat eradication, and we have certainly seen that, but we were much less optimistic about puffin. "Ten years ago its population had reached such a low level we worried whether it would survive, to see that puffin is now doing so well really is exciting." Despite the success on Lundy the puffin is continuing to struggle elsewhere. The bird is in decline in northern Scotland, Orkney, Shetland, the Faroe Islands, Norway and Iceland after a plunge in the number of sandeels, its favourite food. "What do you give to a hungry fisherman? What do you give to a hungry fisherman? If there's no fish in the sea, there's fish in a can! There are reports from Russia that wooly mammoths have have been seen in the 1920's. They were in the remoter areas of Siberia and the inhabitants seem to have known about them for ages. Ooh..cite your source, most interesting. Mammoths appear in BH's 'On the Track of Unknown Animals', pretty much all of the stories will be retellings of those anecdotes. The world is apparently full of unknown creatures, but there aren't that many accounts to go round. All right; there is a reasonably credible account from the book that I have mentioned elsewhere on this forum, Strange Stories of Alaska and the Yukon. The author or editor is Ed Ferrell. Sightings of a living mastodon or mammoth were reported in the Far North as late as the 1870's. But the ones from Siberia have been more recent. I'll have to do a bit more digging on those. This story was dissected on R4 Inside Science & declared to be a false news/fluff story without any basis in fact. They have sequenced mammoth DNA but apparently not in a complete structurally sound form & there's some way to go with this. In addition, the story was about gestating a mammoth embryo in an artificial womb, not in a living elephant. The problem with this is artificial wombs don't exist. If it was going to happen in 2 years there would be peer reviewable papers to examine. There aren't any. One of the programme participants said it wouldn't happen within 10 years. That's not to say it won't eventually..
Just put a sheepskin rug on an elephant and there you go. Sorry, missed your post,vultures in the Netherlands last year !. ... When black rats invaded Lord Howe Island after the 1918 wreck of the steamship Makambo, they wiped out numerous native species on the small Australian isle in the Tasman Sea including a big, flightless insect that resembled a stick. The glossy-black insect that grow up to six inches (15 cm) in length is nicknamed the “land lobster.” Other stick insects are found around the world, so named because their appearance lets them blend in with trees and bushes to evade predators. Because of certain differences between the Ball’s Pyramid insects and the Lord Howe Island insect museum specimens, there was some question about whether they were the same species. “We found what everyone hoped to find, that despite some significant morphological differences, these are indeed the same species,” said Mikheyev, who led the research published in the journal Current Biology. A species of tiny, adorable marsupial that scientists thought had been locally extinct for more than 100 years has re-emerged in New South Wales, Australia. That's right, it should be 'Mulgara found for the first time in a part of its known historic range', they were known from elsewhere, and have never been considered extinct. Just seen this, the great auk, AKA the woggin, is much more exciting than any hairy elephant. Thanks for the clarification. The article wasn't clear on what was meant by 'local extinction'. Interesting. Your link mentioned wild pigs. Wild pigs in this state are a bloody nuisance. There are no bag limits and as I understand it, very few restrictions on taking them. Plus, they are good eating. And it would be absolutely great if some species can be 'un-extincted'. It must be said, if it weren't for what it represented, it wouldn't be classed as a terribly good photograph. A black panther has been photographed in Africa, the first in 100 years. What are the odds it was released there by Marvel Entertainment? I hadn't realised they were so rare.